The Zoom Rooms Daily Audio Testing automatically conducts an audio test in your Zoom Room each morning between 2 AM and 4 AM, local time. It uses the speaker and microphone to test for echo. If echo is found, an alert will be displayed on the Zoom Room controller. You can also conduct a manual test from the Zoom Room controller at any time. An alert is displayed on both the Zoom Room controller and the display before the audio test is started. Users can cancel the test before the automatic testing or at any point during the test. 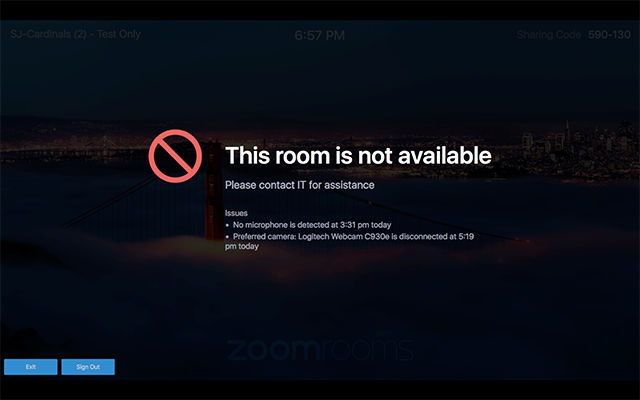 Sign into your Zoom web portal and navigate to Zoom Rooms. Click the Edit button next to the location you chose. You can do this on an account level, a location level, a floor level, or a room level. For the entire account: Go to Zoom Rooms and click on Account Settings. For a location: Go to Zoom Rooms and click on the name of the location. Click on Edit at the top. For a floor: Go to Zoom Rooms and click on the arrow next to the location. Click on the name of the floor from the list. Click on Edit at the top. For a room: Go to Zoom Rooms and click on the name of the location on the left. Click on the name of the floor from the list. Click on Edit to the right of the room name. Toggle Audio Device Daily Auto Testing to on (blue). To run a manual test, you need to first have Zoom Rooms audio testing enabled for the room. Toggle Lock Settings to off. Enter the Zoom Rooms passcode to access the settings. A progress bar will appear on the Zoom Room controller and display. Tap Cancel at any time to end the test. Once the test is over, the Zoom Room controller and display will show the results of the test. Learn more about test results. If the daily automatic audio test passes, the display and controller will briefly display a message that the room has passed. However, if the testing fails, the computer and controller will display a message that the testing has failed and attempt to restart the room. 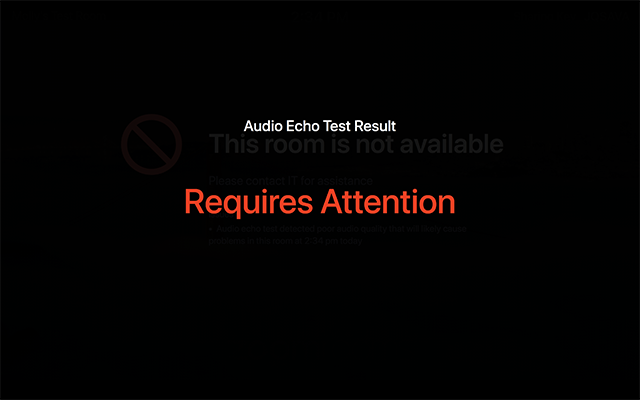 If a Zoom Room fails, it will display a warning in dashboard that there is poor Audio Quality. You can also receive email notifications when a Zoom Room's audio needs attention. To receive these notifications, enable the Audio Device has quality issues email notification. Learn more about Zoom room alerts and notifications.